Asphalt shingles are one of the most popular types of roofing in the world due to their affordability, simple product design and durability. However, not all asphalt shingles are the same. There are a different types, which fall into three main categories. They are 3-tab shingles, dimensional shingles and luxury shingles. While all three kinds of shingles are made from similar materials, they aren't exactly the same. Read through this breakdown of the different types of asphalt shingles to help understand which one will be right for your home. 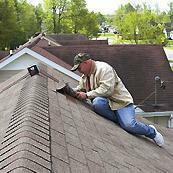 The most affordable roofing option in most cases are 3-tab shingles. This single layer, 3-tab shingle are quite basic in terms production method and looks, but they are designed to last multiple decades under the right conditions. These shingles are incredibly lightweight, which means you won't have to worry about any sort of reinforcement to install them. What they lack in aesthetic value, they make up for in affordability and longevity. While 3-tab shingles will generally last 15-20 years, dimensional shingles have a lifespan of 30 years or more in most cases. They are designed with strength in mind, making them highly durable compared to their cheaper counterparts. These shingles also have a better look to them, according to many professional and homeowner opinions. These shingles are available in a wide range of colors to match any home. If you want to up the looks of your home even more while getting the excellent durability of dimensional shingles without the cost of slate or tile, luxury asphalt is for you. They are designed to replicate much more expensive roofing options, but at a fraction of the cost. A slate roof could cost as much as 10 times that of luxury architectural shingles, but still look about the same! If you aren't sure which shingle is right for you, be sure to talk with a local residential roofer about your budget and your wants and needs regarding looks and durability. For professional asphalt shingle roofing in McKinney or Wichita Falls reach out to Trifecta Roofing & Construction. Our team offers expert roofing of all types, including shingle and tile. To learn more, or to request an estimate from an expert roofer in Wichita Falls or McKinney, Texas, give us a call at (469) 620-7672 today.